Бен Батлер (Ben Butler) создаёт поистине удивительные скульптуры из дерева. Его абстрактные инсталляции напоминают геологические образования, что рождает яркий контраст с материалом из которого созданы скульптуры. Бен Батлер Окончил Институт Искусств Чикаго со степенью бакалавра, в качестве профессора преподаёт в Колледже Искусств Родоса. Его деревянные скульптуры выставлялись на персональные выставки в Нью-Йорке, Чикаго, Сиэтле, Вашингтоне и других городах. В настоящее время Бен живёт и работает в Мемфисе, штат Теннесси. Ben Butler received his MFA from the School of the Art Institute of Chicago and his BA from Bowdoin College. His work has been exhibited in solo shows in New York at Coleman Burke Gallery and Plane Space, as well as at Zg Gallery in Chicago, John Davis Gallery in Hudson, New York, and Davidson Galleries in Seattle, among others. He is the recipient of a Pollock-Krasner Foundation Individual Artist Grant and numerous fellowships at residency programs including the MacDowell Colony, The Bemis Center for Contemporary Art, and the Ucross Foundation. He currently lives and works in Memphis, Tennessee and Quogue, New York. 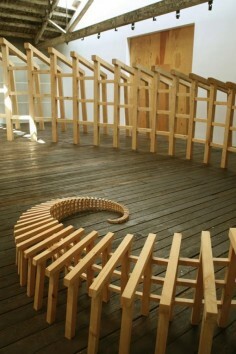 Truly fascinating wooden sculptures by Memphis, Tennessee based artist Ben Butler. Each of the forms are meant to be abstract but take on an organic feeling and seem to resemble geological formations, making for a rather nice contrast to the fact that the sculptures are made from wood. One thing that I’d advise you not to miss is the larger projects that Ben has been involved with which in some cases feature sculptures that fill entire rooms. These are completely hand-done with no use of computer aided design, which is pretty mind blowing when you examine the detail of Ben’s work, particularly the indented piece found in the fifth and sixth images here. I think this is my favourite creation of his by a long way as you can see each mark of his tool around the entire sculpture, it’s very striking.